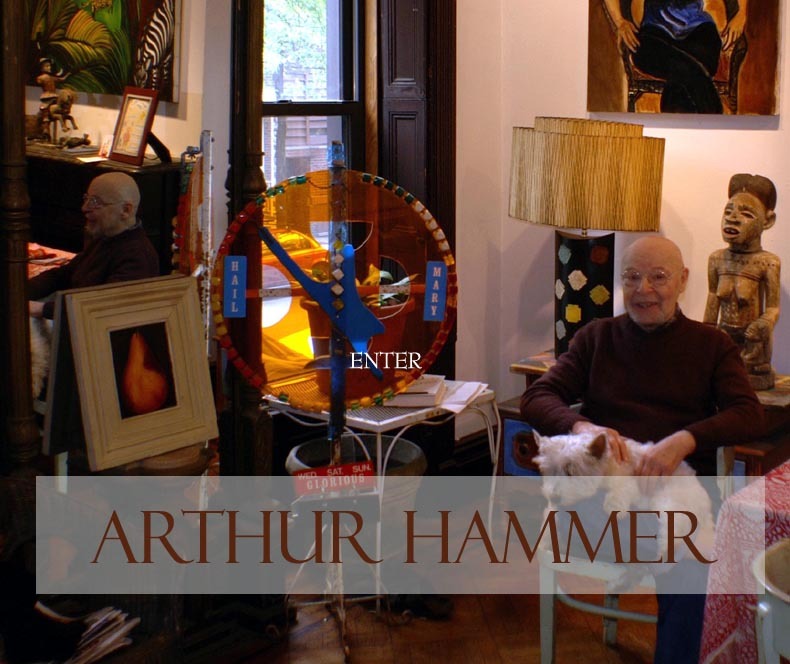 Artist NYC.org is pleased to welcome painter, Arthur Hammer, to our on-line gallery. After a successful career as a actor, including a stint on Broadway, Arthur turned his talents entirely to art in the late eighties. His paintings can be found in numerous private collections including those of Sting — The Perplexity of the Yellow Monkey — and Robert and Sheila Goodwin (former producers of the X-Files) — The Straining Man; Steel Warehouse; Ferry Boat Landing, Maine; etc. We are happy to be able to share not only his artwork, but a glimpse into his studio in the townhouse that he shares with his dog Bucky. It is a place as vivid and unique as the artist himself. His many paintings and sculptures live side by side with pieces from folk artists, gifts from friends and pieces from flea markets: It is a place of magic and a delight to the eye. Select "Show Background" or . .. There are two ways to view Arthur's paintings: 'Show Background' shows background glimpses of Arthur's studio; 'Remove Background' displays paintings against plain white.